From Rose Tremain comes the Booker Prize short-listed novel that “restored the historical novel to its rightful place of honor” (New York Times). Robert Merivel, son of a glove maker and an aspiring physician, finds his fortunes transformed when he is given a position at the court of King Charles II. Merivel slips easily into a life of luxury and idleness, enthusiastically enjoying the women and wine of the vibrant Restoration age. But when he’s called on to serve the king in an unusual role, he transgresses the one law he is forbidden to break and is brutally cast out from his newfound paradise. Thus begins Merivel’s journey to self-knowledge, which will take him down into the lowest depths of 17th-century society. 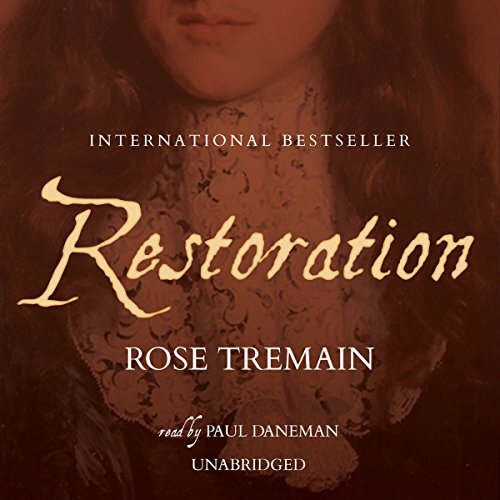 ©2013 Rose Tremain (P)2013 Blackstone Audio, Inc. This was my third five-star read out of 71 books read so far this year; I don't hand out that rating very easily, and when I do, it's because the book has surpassed any expectation I may have had, made me want to start again right from the beginning as soon as I'd finished it, and opened up a universe which was somehow magical to me. As far as expectations go, they were pretty high, as this novel first came to my attention because it had been shortlisted for the Booker Prize, and I had read very positive reviews for it, so it had been on my wishlist for a long time. My first book by Rose Tremain, which was among my favourites of 2013, was Music & Silence. There's a certain quality about Tremain's writing, or about the way she tells her stories, or about the characters she creates or all of these put together, which I find very exciting. From the first words, I'm willing to follow her wherever she wants to take me. The story is set in the England of 1665 and is told as a first person account by one Robert Merivel, who relates the events as they are happening, probably in the form of a personal journal. All the events take place over the course of approximately one year, and it's a year filled to the brim with events for Merivel in the England of the Restoration. Introduced by his father, a glovemaker to the King, Young Meviel, a student in medicine, meets Charles II for the first time and immediately falls under his spell, so that when King Charles asks Merivel to save one of his dying dogs (his beloved spaniels of course), Merivel jumps at the chance to be part of the inner circle of Whitehall Palace and successfully cures the dog, mainly by doing nothing. Merivel further captures the king's favour with his comical antics, and the king comes to affectionately call him his Fool, which delights Merivel, as being in the king's favour and among his friends is a privilege he revels in. He is given a grand estate, and immediately sets about decorating his large house in an effusion of baroque colours, in the most vivid hues, then takes an interest in painting and music, and indeed he observes all around him with an artist's eye. One day the King tells Robert that he would like him to wed one of his mistresses, Celia Clemens. Merivel is a rather ugly man and uncouth in his manners, liking to amuse the court with his frequent farts, among other things, but the king likes his last name and likes to think of his mistress as the future Mrs Merivel. The one condition he sets it that the marriage must not be consummated, and so enamoured is Merivel with his monarch that he immediately accepts the arrangement. Merivel is a great lover of all the finer things in life; along with the decorative arts, fine cuisine and wines, he also enjoys the company of women and rarely denies himself anything, so of course it follows that he is bound to fall in love with Celia, even though the latter detests him to the core. The trap is set, and what rises must fall, and throughout this novel we follow Merivel's progress from King's physician to wannabe artist and musician, to his time spent in the New Bedlam hospital, in Norfolk, where he tries to cure the insane once he has fallen from grace, a place from which he manages to fall from grace even further. Merivel is a fascinating character and though he doesn't dwell much on why he is so obsessed with the king or any of his inner motivations, he doesn't lack in observational skills and describes his daily life and the happenings among these unusual circles of people in a very amusing manner, though the novel doesn't lack for depth. I was very happy to discover that Tremain wrote a sequel in 2012, simply called Merivel which I obtained as soon as I'd started on Restoration, being completely enchanted by it, and it won't be long before I pick up the sequel. This book was narrated to perfection by Paul Daneman, one of those narrators I liked so much that I immediately tried to find what other books I could get by him, but unfortunately, this is the only one on offer at present. There will be more Tremain in the near future for me, as she is one of these writers by whom I would love to read the complete works.